The person who invented this bag must have had enough of getting his back dirty when he carried the rucksack. And I’m glad that someone else in the world thought so too. 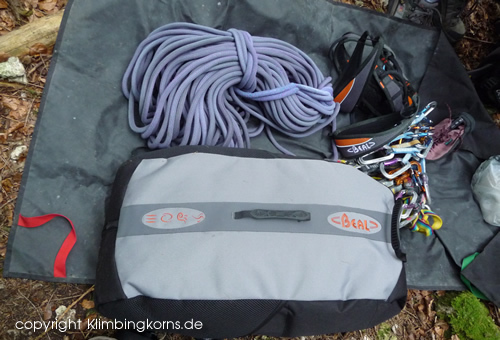 Finally a Beal Cliff Rope bag which has the zips at the right side! What a genious idea! This is an upgraded version of the standard Beal Combi Rope Bag which offers the user rear access via a long pack length double zip. It’s wonderful to use on especially when you’re in very dry and dusty areas or moist, damp and filthy ones. 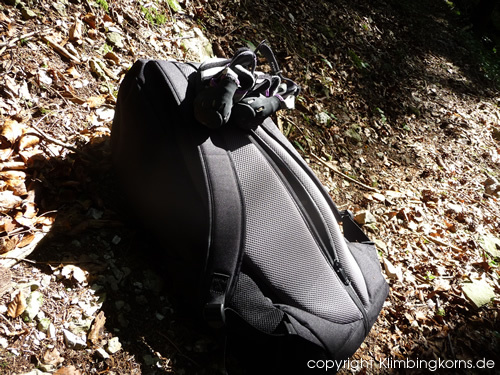 Since access to 90% of the sport climbing areas do not exceed 20-30 minutes, this bag is ok to carry all all your climbing gear you need. It comes with two haul loops for hanging out your carabines and gear. 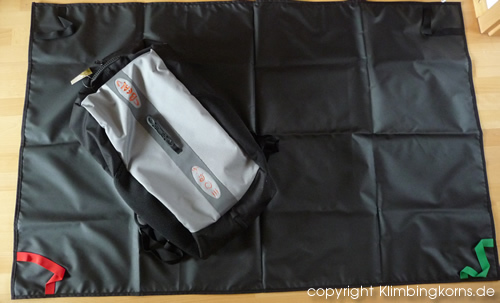 Zip pockets and net pockets on each side on the insides ensures that you have your impt belongings safe and sound. The bag is equipt with a rope mat so you could practically leave your material at the side while you carry your rope to your base climb. The detachable mat has good thick quiality which ensures that it does not tear after a short time, seems to be well impregnated as well. 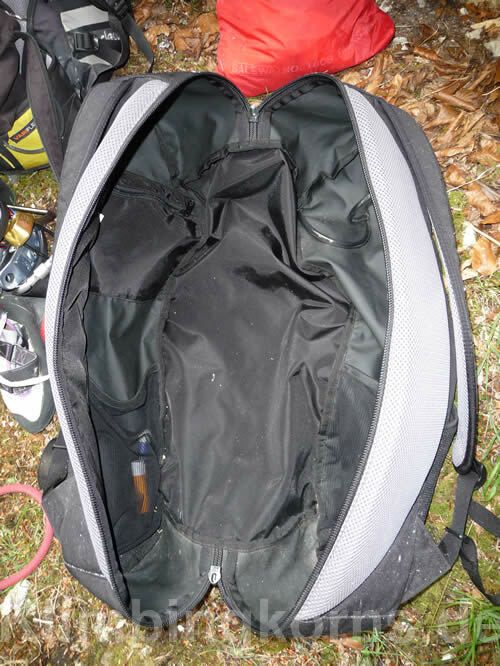 It also features side pockets for small water bottles or boots…but I would’ve wished for a more strechable net where you can squeeze in more stuff when needed. 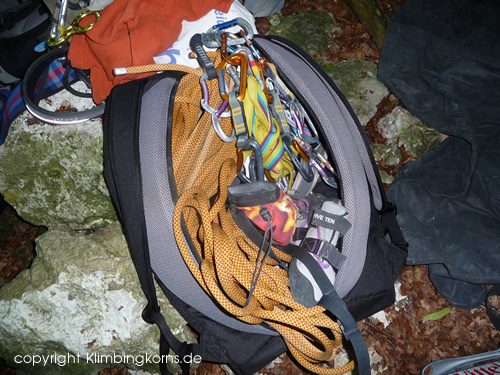 Sport climbers and boulderers – this is the gear bag for you. This does not replace the normal rucksack. For longer journeys and trails a traditional rucksack of course the better choice. Clip /Straps possibilities at the back or top of the bag to tie up any additional gear that doesn’t fit in the bag. Bigger external side pockets that comes in strechable net. Right now, only a very small water bottle can find it’s place ….moreover itms tends to slip out if not stuffed in proper. Form the bag a little to ease off carrying at longer accesses. Nice review. :) Some webshops write that the bag has “2 inside carry material”. What the heck is that? Does it have racking loops inside? And if so, do you have pictures of it? Thanks! With “2 inside carry material”, they mean these equipment loops for your quickdraws. There’s one on the left, and another on the right side of the bag interior. I’ll try posting up a picture soon.